So last night I went to The Killers gig with my boyfriend. I have to say, even though I'm not a major fan of The Killers, I had an absolute ball. Brandon Flowers and co. were supported by HAIM, Two Door Cinema Club and Frank Ocean - my fave of the night. It was a scorcher of a day and having that in combo with good music, drinks and atmosphere, what could possibly go wrong? Nada. With it being an outdoor concert, festival fashion was in full swing. And believe me when I say, I saw the good, the bad and the ugly (ridiculously tiny daisy dukes, I'm looking at you!). So this is what I wore! Excuse my sour face in these pics.. The sun was in my eyes. I don't look this mean all the time, I swear! I decided to make the most of the festival look by jumping on the flower crown bandwagon. Mine is from ASOS and being honest, I did get quite a few looks when I was leaving my house but once in the venue, I didn't care! I wore an oversized baby pink tee from Topshop which was perfect for the laid-back look I was going for. I wore it over one of my staple pieces i.e. a plain black skater skirt from River Island. My trusty chunky gold chain had to make an appearance, obvs. And then I added a bit of an edge to the girly look by wearing a pair of black ankle boots from H&M, which I have to add were perfect for jumping around to Mr. Brightside - no sore feet yay! Frank Ocean fangirling at its finest. chunky gold chains make everything better haha love love love frank ocean too! Oh you look so pretty with this flowers. They fit perfectly to your sweater and hair :). LOVE your flower crown....perfect for any music festival!!!! Great blog. i am really liking the style of your blog and all your posts :) i am now following you on gfc and bloglovin! 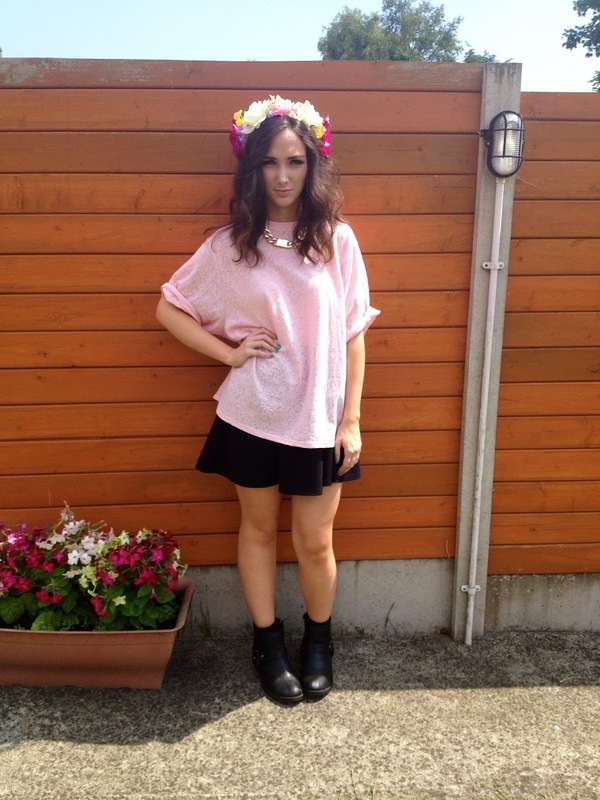 Love floral crowns at the minute too! If you check out my blog I have a 20 percent discount code off Roses&Clementines floral crowns. They are handmade and gorgeous. :) Lovely blog by the way, keep it up! I realllllyy want one of those oversized tees to wear as a dress in Summer! You look gorgeoussss, I love floral crowns waaa wish I could pull one off! They are so handy for the hot weather and look good with practically anything! haha Thanks so much and of course you can ;) Would love if you gave my blog a follow! I love your headband! I really want one but I am not going anywhere suitable to wear one! Nice outfit and pretty eyes! Just followed you with google and blogloving! Ahh thank you that's so lovely :) Definitely! I'll check out your blog now! this outfit is gorgeous! I love the top so so much! And the floral crown is so festively. 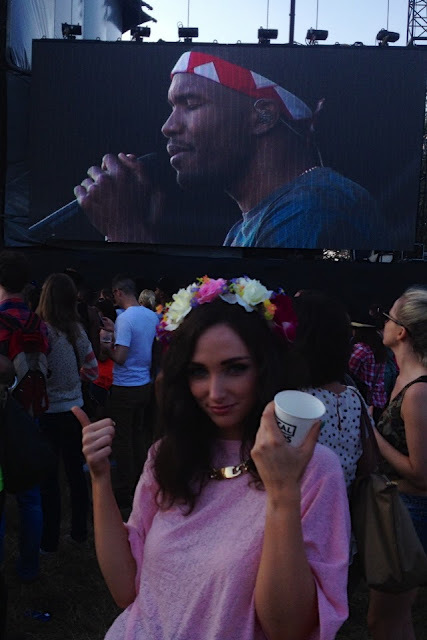 Jealous of you seeing Frank ocean! Lovely Outfit! you look so sweet:) Im following you!